WHILE tracing the history of the freedom movement of India, little importance has been attached to the efforts made both by Maharaja Duleep Singh, exiled in Britain, and his cousin Sardar Thakar Singh Sandhawalia in India to free their motherland from the British. Sardar Thakar Singh Sandhawalia prepared the exiled Prince not only to re-embrace Sikhism, his original religion, but also imbued him with zeal to return to India to wrest back his lost empire after abrogating the Treaty of Bhairowal (1846) and Terms Granted (1849) by which he had lost not only his kingdom and the Kohinoor but also the right to reside in the Punjab. Hailing from Raja Sansi village (now known for the international airport in Amritsar district), Thakar Singh was born in 1837 and was only 12 years old when Maharaja Duleep Singh lost his empire to the British. He was a witness to the goings on of the First War of Independence in 1857, in which his father-in-law Raja Nahar Singh of Ballabhgarh was hanged to death. The turning point in his life came when he learnt about the conversion of four Sikh students of Amritsar Mission High School into Christianity in 1873. 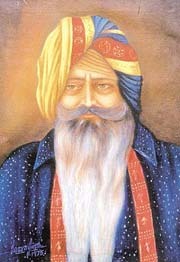 He immediately summoned a meeting of prominent Sikhs like Baba Khem Singh Bedi, a descendant of Guru Nanak, Kanwar Bikram Singh of Kapurthala and Sikh scholar Giani Gian Singh of Amritsar and laid the foundation of the reformist Singh Sabha Society on October 1, 1873, of which he became the founder President. The British divested him of his powers as Extra Assistant Commissioner at Amritsar and his entire estate was brought under the control of Court of Wards. About the same time, he received a telegram from Maharaja Duleep Singh, asking him to give the details of his properties in Punjab. The Maharaja also invited him to visit England. The British Government was opposed to the visit of Thakar Singh to England but as its ties with Maharaja Duleep Singh had not deteriorated to the level beyond redemption, it allowed him to visit England. By helping Talbot, an English solicitor sent by the Maharaja from England for identifying his properties in India, Thakar Singh became the most hated man in the eyes of the British Government. However, he left Amritsar on September 28, 1884. He went to England accompanied by his sons Narinder Singh and Gurdit Singh and a granthi called Partab Singh. He wanted the granthi to recite the Guru Granth Sahib to the Maharaja. In England, Thakar Singh would talk of the lost riches of the Punjab and Talbot’s report. "But, Thakar Singh Sandhawalia had carried with him to England something much more potent than a list of lost property. He bore the keys to the whole kingdom in the form of a prophecy," says Christy Campbell, a researcher. According to the "prophecy", the Maharaja was to return to India through Russia and regain his lost empire after extensive bloodshed. The Maharaja did not believe the prophecy earlier but Thakar Singh Sandhawalia wrote to his eldest son Gurbachan Singh in India to obtain written statements from principal Sikh priests verifying the prophecy. These were then signed and sealed and sent to Elvedon Hall. After that there were no doubts in the gullible Maharaja’s mind. A year later, the impolitic Maharaja committed one of the most tragic mistakes of his life by mentioning that prophecy in a letter to Lord Randolph Churchill, Secretary of State for India. In order to embrace the religion of his forefathers, Maharaja Duleep Singh left England on March 30, 1886. He requested Thakar Singh to reach Bombay and arrange the ‘Pahaul’ ceremony. The Maharaja, upon knowing that the then Lieutenant-Governor of Punjab would not allow him to visit Bombay, wrote to the British Secretary of the State of India to give him permission. While the entire Punjab was anxiously awaiting the return of their Maharaja, Duleep Singh was served a notice to stop at Aden. The re-conversion ceremony was performed at Aden with the help of Sikh representatives sent by Thakar Singh Sandhawalia. Since the Maharaja was refused permission to visit his motherland and settle down in India, he became ‘an implacable enemy’ of the British empire and abrogated the Treaty of Bhairowal signed by him on July 15, 1886. He decided to sneak into Pondicherry, a French territory in India where the writ of the British empire did not extend, in order to carry out his plan of arranging an insurrection. He also planned to take the help of 30,000 Russian troops for the attack. The ban on the entry of Maharaja Duleep Singh to India and the calculated attempt to keep Thakar Singh away from him had made them both bitter enemies of the British empire. Expecting the Maharaja to arrive at Pondicherry, Thakar Singh decided to shift to this French territory to further his designs. The French government offered him a monthly allowance of 1000 francs, which he refused. Enjoying the freedom of French territory, he started circulating the Maharaja’s correspondence in Indian newspapers like The Times of India and Modern Times. Maharaja Duleep Singh appointed Thakar Singh as Prime Minister of his ‘government-in-exile’ and asked him to nominate agents and also contact Maharaja Scindia of Gwalior and Maharajas of Patiala, Nabha, Faridkot, Jind and Kapurthala for help. Dogged by the British detectives, J.C. Mitter and Azizuddin, Thakar Singh breathed his last on August 18, 1887, in Pondicherry due to what was called plain fever. Circumstantial evidence, however, suggests Azizuddin’s hand in the death of the Sardar. This is confirmed by Christy Campbell in her book The Maharaja’s Box. The arrest of Arur Singh, Maharaja’s personal attendant and messenger, soon after the death of Thakar Singh inflicted a fatal blow to their plans of invading the British in India. Disappointed and heartbroken, the Maharaja returned to Paris as a Sikh but by the time he breathed his last in 1893, there was no fellow countryman close to him to cremate him according to the Sikh rites. He was buried in the church at Elvedon Hall Thetford by his Christian son Frederick. Along with him died the dream of liberating the Punjab and India. Roughly seven decades later in 1966, the Punjab Government issued a letter to Sardar Beant Singh Sandhawalia, a great grandson of Sardar Thakar Singh Sandhawalia, asking him to collect Rs 5000 as ‘symbolic’ compensation for the estates of Sardar Thakar Singh Sandhawalia from the office of the Deputy Commissioner, Amritsar. Even if the much-touted claims of Sardar Beant Singh Sandhawalia on Kohinoor or other precious items appear debatable, it would be worthwhile to name the Amritsar international airport at Raja Sansi after Sardar Thakar Singh Sandhawalia.